Nobody likes a slow laggy device and the good news for Apple, and all who sail with her, is that this is usually something the company gets right. The combination of software and hardware design means that Jobs and Co. know just what level of components are required to make their machines run properly. The word is that the iSlate won't have an Intel Atom chip at its heart which leads us to wonder whether it's going to be something similar or the kind you'd find in a full size latop; maybe something with more than one core? Combine that with a good chunk of RAM and GPU at least as powerful as the graphics device inside the iPhone and there's all the foundations of a really interesting unit. With a multi-core CPU and enough number crunching memory too, there's every reason a tablet could multitask. Let's face it, plenty of other smartphones offer this already. Until now, Apple has kept this out of its mobile offerings but with a home tablet, you're going to need a little more flexibility at your fingertips. Someone's on a call with you, video or otherwise, and maybe you want to send them a link or browse some pertinent information on the internet and you'll need to be running more than one application at a time. The very fact that a tablet is for such a fluid environment means that it's going to need to be a bit of a Swiss Army Knife - often with two of those blades out at any one time. One classic hope for a home tablet would be to be able to take the TV show you're watching on your main set to another room as you need. Whether by a TV adaptor or otherwise, catching transmissions direct from your main panel and display them on the small portable screen anywhere about the house would be a real bonus. Perfect for keeping up with domestic life while bringing the entertainment with you. Take this one step further and perhaps you could even tap into the source over the internet and 3G network while out and about but with mobile data speeds and prices, that might be pushing it. Doubtless viewing videos is going to be a big part of life on the Apple tablet. So as good a screen as possible would be a real winner. An OLED or AMOLED would be the obvious choice here to provide glorious crisp contrast, wonderful deep colours and all at a low power outage to keep the battery lasting as long as possible. The downside, of course, is that such a display would probably send the price of thing through the roof. So, an equally good shout would be an HD resolution LCD. Pixel density makes watching films on the iPhone a great experience, so factor that up to a tablet size device and we really have to be talking about a 1080p display. It seems that the New York Times and others are brokering deals with Apple to supply newspaper and magazine content for the tablet and there's even word of book publishers like Harper Collins getting in on the action too. As much as we're getting used to reading on LCD screens for longer periods of time, if the iSlate could switch the display to e-ink or e-paper mode, then not only would it be the first to be able to do so but it would mean it could grab a massive chunk of the eReader market too. That alone could offer financial success. For the consumer, of course, it would mean one less device to carry around a break for dry-balls everywhere. We're not slating the Mac OS. Everyone knows it's good but to really get it to work, you need a keyboard. Touchscreens are all fun and games but the minute you need to do a fair bit of typing, it'll start to lose it's edge. OS X is a desktop operating system. iPhone OS is for touchscreens. The functionality of the full Apple software would certainly be appealing, and perhaps very tempting seeing as there's a good chance that the hardware in the iTablet would allow people to run it, but it's really too fiddly for finger operation alone - finger and thumb too. The way to get round that might be to add a slideout QWERTY but there's all sorts of cascading problems out of that decision too. First, it makes it bigger, heavier and more clunky and, second, there's something of admitting defeat about it. It would almost be saying that Apple couldn't engineer something simple and intuitive enough to work without having to drop a big old piece of kit on top of such a lovely svelte device. That's not what the Cupertino creed is about. As a portable tablet for home and on the go, it's going to need the holy trinity of connection - 3G, Bluetooth and Wi-Fi. What's more, if it can't stream content over your home network, then it's a dead loss too. Naturally, 3G is a must to do anything with it internet based and away from home, and Wi-Fi it will most certainly have. If there's no media streaming option, then the user is stuck with side-loading or synching over the internet at best. The first would be a terrible ball and chain and the second both laborious and costly once you've factored in the MobileMe subscription. Bluetooth might seem like an odd one but there's one important use and that's for making hands free phone calls. It could be circumvented partially by a really good speakerphone system but then everyone's going to hear both sides of your conversation which you might not necessarily want. For any mobile device these days, functionality versus battery life is the million dollar trade off. Get this one wrong and you cripple your product. With so much expected and so much possible from the iTablet , it's going to need one hell of an efficient and powerful battery. It has to keep up with the demands of being left on the sofa for a couple of hours before being needed again. Some efficient power management from the software would be a big help as would a low-voltage processors. It's also another reason why we might not see multitasking. How the company organises docking will also be an interesting one to watch for. Obvious ones really but this tablet is going to need to be totally hands free from time to time. A 10-inch, or thereabouts, device is going to get tiring to hold for the length of an entire film, so some kind of clever kick stand or perhaps dock is going to be needed. Its omission might not be a total disaster and naturally would spring dollar signs onto the eyeballs of Belkin and Griffin and pals but having no built-in speakers might be harder to stomach. If this thing is to be taken about the house and used in different settings, then chaining it to you ears via headphones cable would be both taxing and rather impractical, particularly if you're trying to do the washing up while listening to Spotify at the same time, say. Make this thing too big and there's going to be little point in choosing a tablet over a laptop. Apple, of course, is unlikely to make this kind of mistake. 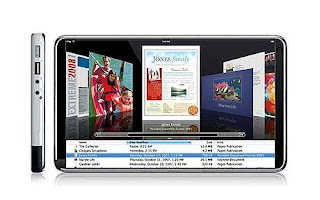 One of the pillars on which the company has rebuilt its comeback is that of design and with Jonathan Ive at the helm, it'd be a shocker to say the least if the iTablet wasn't as carefully created as the iPhone, iPod and all the iMacs before it. That said, anyone can make a mistake.